What do hostage negotiation and political campaigns have in common? How can you use lessons learned while saving lives to win votes and earn donations? Chris Voss, a 24-yr FBI veteran and former lead international kidnapping negotiator is here to answer those questions and more! Chris Voss is CEO of the Black Swan Group and author of the national best-seller “Never Split The Difference: Negotiating As If Your Life Depended On It,” which was named one of the seven best books on negotiation. In 2008, he founded The Black Swan Group which specializes in solving business communication problems using hostage negotiation solutions. Chris has used his many years of experience in international crisis and high stakes negotiations as an FBI agent to develop a unique program and team that applies these globally proven techniques to the business world. Chris and his team have helped companies secure and close better deals, save money, and solve internal communication problems between senior management and employees. Prior to 2008, Chris was the was the lead international kidnapping negotiator for the Federal Bureau of Investigation, as well as the FBI’s hostage negotiation representative for the National Security Council’s Hostage Working Group. Before becoming the FBI lead international kidnapping negotiator, Chris served as the lead Crisis Negotiator for the New York City Division of the FBI. Chris was a member of the New York City Joint Terrorist Task Force for 14 years. He was the case agent on such cases as TERRSTOP (the Blind Sheikh Case – Sheikh Omar Abdel-Rahman), the TWA Flight 800 catastrophe and negotiated the surrender of the first hostage taker to give up in the Chase Manhattan bank robbery hostage taking. During Chris’s 24-year tenure in the FBI, he was trained in the art of negotiation by not only the FBI but Scotland Yard and Harvard Law School. He is also a recipient of the Attorney General’s Award for Excellence in Law Enforcement and the FBI Agents Association Award for Distinguished and Exemplary Service. Chris has taught business negotiation in the MBA program as an adjunct professor at University of Southern California’s Marshall School of Business and Georgetown University’s McDonough School of Business. He has also taught business negotiation at Harvard University, guest lectured at The Kellogg School of Management at Northwestern University, The IMD Business School in Lausanne, Switzerland and The Goethe School of Business in Frankfurt, Germany. Chris has been featured in TIME, Business Insider, Entrepreneur, Inc., Fast Company, Fortune, The Washington Post, SUCCESS Magazine, Squawk Box, CNN, ABC News, and more. Connect with Chris Voss on LinkedIn, Facebook and Twitter. Find out more about him at www.BlackSwanLtd.com. 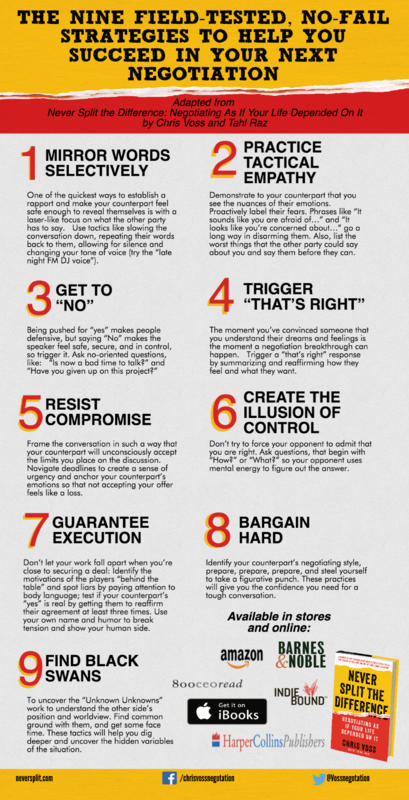 Here’s the link to the Infographic about the Nine Field-Tested, No-Fail Strategies To Help You Succeed In Your Next Negotiation. As a bonus, here are a couple of blogs from Chris Voss and his colleagues, Brandon Voss and Derek Gaunt. Sign up for a free virtual mentorship with Chris by texting FBIempathy to 22828. [15:03] What does it mean to, “Get to No” and why does it matter? [33:45] What can hostage negotiation victories teach me about raising money for a political campaign? [36:40] “You’re right vs That’s right.” A small change that makes all the difference! [41:45] Why do you think that TOO MUCH compromise is what’s wrong with politics? [50:08] What is a Black Swan and why do they matter? [58:36] Raz’s final thoughts and how you can support the Podcast! If you enjoy this podcast, I hope you’ll consider supporting us by becoming a patron. Every dollar we receive goes straight into producing top quality content that will help you and people just like you make a growing impact on our country. Do you want the podcast to disappear? If not, please consider supporting us with a small, monthly donation. It may seem small to you but it’s a huge blessing to us!